Studying for the NCTJ distance diploma in journalism is no mean feat! After working for an innovation agency, attending the Edinburgh International TV Festival trainee scheme, and doing a stint on a BBC consumer news show, I registered to study towards a diploma in journalism. I think journalism skills are going to be vital for the next generation of innovators and entrepreneurs. They should be taught in every high school. I fully appreciate that journalism is a tough industry. But despite cut-backs and job losses (such as those initiated by the Philly Inquirer), the shut-down of many local papers in the UK and the USA, and the revelations of the unethical 'phone hacking' culture at certain papers in the UK, I don't think it's a dying industry. It's changing. 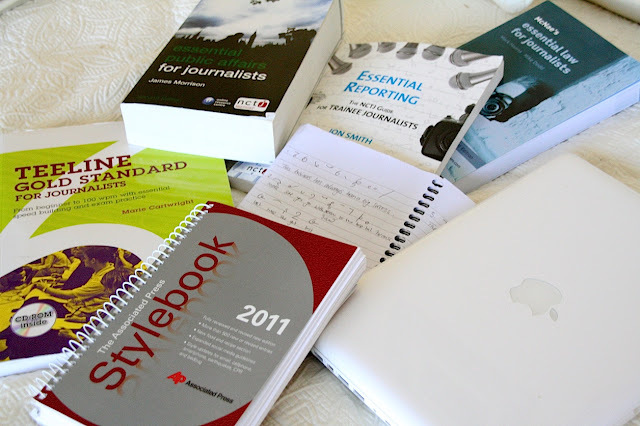 Completing the diploma will qualify me a journalist, but I think there's so much more to modern journalism than shorthand and reporting style. With the growing influence of the internet in our lives there are opportunities to re-shape how people get their information and news, and to re-shape how media businesses get revenue. That's why I also think programming skills are going to be vital for the next generation of innovators and entrepreneurs. At the age of 11 I taught myself HTML and made some zany Geocities sites from scratch. This year I've slowly been working through the Code Year modules, especially in CSS, to brush up my skills. I'm creating my own DIY course in modern journalism skills! I love to keep tabs on innovations in news, media and community journalism. I love to follow community journalists, journo-bloggers, media analysts and academics on Twitter. Homicide Watch is a really interesting new model for crime reporting in DC and Clear Health Costs is a brilliant initiative set up by journalist-entrepreneurs to help Americans analyze the costs of healthcare options, to name but two exciting examples of new journalism ventures. My diploma is all long-distance home study, so I was sent a box full of books and I've been working my merry way at them, amongst moving to another continent and spending catch-up time with my hubby. I knew there'd be a time for adjustment to my new country, and doing this has been great for focusing my time while I search for jobs and opportunities. It's tough work though, especially when I don't have class-mates to keep me motivated or to bounce ideas around with and share insights. If you see me on Twitter or like my little blog here, please do send me some words of encouragement! Oh, and if you love new media as much as I do, I'd love, love to chat to you! Follow me on Twitter or visit my other site where I'm going to try to focus my media blogging in future. And if you don't love new media as much as I do, don't worry, you know I love trashy TV too, and all the new US shows are coming to screen soon. Are you learning any new skills? What do you think is the future of journalism? And have you been doing Code Year too? I'd love to hear from you!